Just in case you missed the update, there is no mid-week cafe this week. Join us next week for the beginning of our new worship experience called, "First Wednesdays," beginning at 6:30 p.m. If you missed the TXT series about the Bible, you can view the series by clicking here. "Now, Lord, consider their threats and enable your servants to speak your word with great boldness. Stretch out your hand to heal and perform miraculous signs and wonders through the name of your holy servant Jesus." After they prayed, the place where they were meeting was shaken. And they were all filled with the Holy Spirit and spoke the word of God boldly. When we read about God answering prayers in heart-thumping fashion, we want to experience the same kind of thing. Many times we want to feel the ground shake at the sound of God's voice, because if it did, then we would know for certain that God has answered us. But when that doesn't happen; when God doesn't answer us the way we want or when we want, how often do we convince ourselves that God must not be listening? The problem, though, isn't that God doesn't hear us. The problem is with our own perspective on his answers. Don't assume that because God's voice isn't booming down from heaven that he doesn't hear and respond to your prayers. If you are praying for something right now, don't be disappointed if you don't get the answer you want, when you want it. Instead, trust that God, who knows the desires of your heart and the needs in your life, hears you when you call out to him. And trust that he has your best in mind whenever, wherever and however he answers you. Dear God, Sometimes when I pray I convince myself of the best answer for that prayer. Help me instead to trust your answer, your timing and your ways. Help me to realize that your answer to my prayer will always be better than my answer. In Christ's name I pray, Amen. Don't miss this Saddleback showdown this weekend! Pray for Rick Warren as He unwraps the world views of the candidates for the world to see. Rick is the real deal and an awesome man of God and I'm stoked to see this event. TXT, Week 2- "IS THE BIBLE RELIABLE?" If you missed week one of our video cafe or would like to watch week 2, click here. This is a great interview that I think you will be challenged by. The Son of the leader of Hamas has forsaken everything to follow Jesus Christ. Click here to read the whole story or to watch the interview. Yesterday we identified the causes of loneliness. Many of you that struggle with this already knew what some of the causes were! So what do you do about it when you are battling being all alone? Some people become workaholics and simply work, work, work. Others turn to material things and become shopaholics. Still others turn to sexual immorality and affairs to somehow fill the void. Here are a few suggestions for overcoming loneliness. 1. Utilize your time wisely. In other words, make the best of a bad situation. Look at what the Apostle Paul did in his response to loneliness in 2 Timothy 4:12-13, "I sent Tychicus to Ephesus. When I was in Troas, I left my coat there with Carpus. So when you come, bring it to me, along with my books, particularly the ones written on parchment." He didn't mope and say, "I have planted all of these churches and traveled the world to share Christ and now I am being treated this way!" He made the best of his situation. 2. Minimize the hurt. Stop talking about how lonely you are and rehearsing it over and over again in your mind. Don't grow bitter as a result of your situation. Paul said in verse 16, "No one came to my support, but... may it not be held against them." Make a decision that you will not allow your sense of loneliness to cause you to be bitter, but let it cause you to be better. 3. Recognize God's presence. Paul said, "The Lord stood at my side and gave me strength." (v. 17) Where is God when you are lonely? He is right there with you! Jesus said in John 14:18, "I will not leave you as orphans (or comfortless)." God said, "Never will I leave you; never will I forsake you." (Hebrews 13:5) Remember, there is no place where God is not. 4. Empathize with other's needs. Instead of focusing on yourself, look out to other people. Paul said in 2 Timothy 4:17 in response to his loneliness, "The Lord stood at my side and gave me strength, so that through me the message might be fully proclaimed and all the Gentiles might hear it." He never lost sight of his life's goal even at the end of his life: to help others and reach them with the good news of Jesus Christ. 1. What was a lonely situation you faced in the past and how did you overcome it? and encourage them this week! If you missed the first week of this months mid-week cafe you missed a great night. We enjoyed connecting with one another, inspirational acoustic worship and a fantastic video. If you have ever wondered about the history of the Bible, this video is well worth your time. Simply click here and enjoy? We had a great weekend with our guest Pastor Adam McCain. Adam is the director of Christ For The Nations and is involved in various ministries. Our Sunday service was encouraging and sobering and our Sunday night service was inspirational. Saturday morning was much needed. On Saturday he talked to 40-50 leaders from our church about the importance of intimacy with God. Adam defined intimacy as, "a close, familiar & affectionate relationship. We have a tendency to become apathetic and forget that we are in relationship with our Father as Christ-followers, not slaves. (see Galatians 4) He gave 10 signs that you have lost intimacy, or relationship, with God. I was challenged to go deeper in my relationship with God by spending more time in prayer, bible study and ultimately His presense. Have you lost intimacy with God lately? Why not begin restoring that relationship today! God is waiting! This week was a great week with highs and lows. 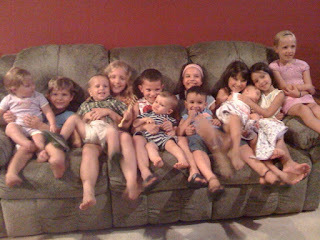 We started off with our small group meeting, pictured is about 2/3'rds of the kids in our group. John & Leslie Fritz moved back to Pittsburgh and it was our final send off. 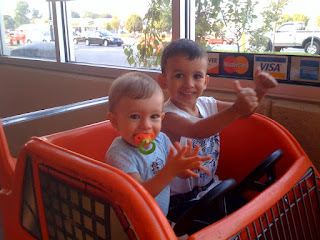 The next pic shows how excited our 2 youngest were to have mom and dad all to themselves. Our oldest 2 went to VBS with friends. 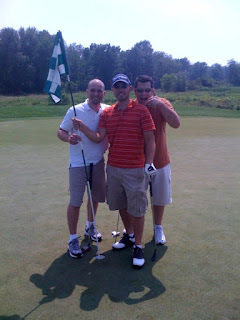 The final 2 pictures show me beating Ed, Buddy & Chad at a specific hole on the Honey Brooke Golf course. 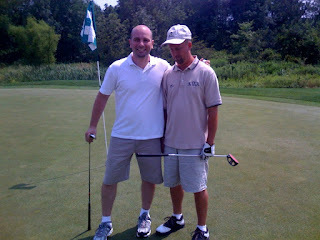 I made them pose with me so that I could have proof that I was better than they were for one hole. I shot a 74 on the front 9 so that kind of tells you why I was excited. 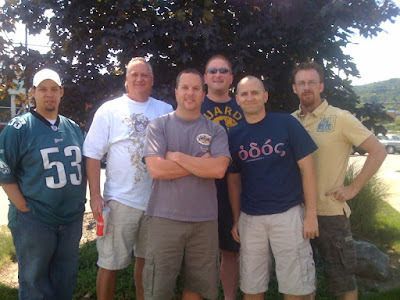 It was a great week and I am having a great weekend with Pastor Adam McCain and friends. More on that later. Thank God for friends, each day it a gift.